What did plants ever do for you? Whether you have green fingers or not, every breath you take, every meal you eat owes a debt to plants. From one little seed, planted into soil, many green lives can arise - from small herbs up to big trees, or from ornamental flowers to substantial crops which all animals and mankind need to survive on this planet. 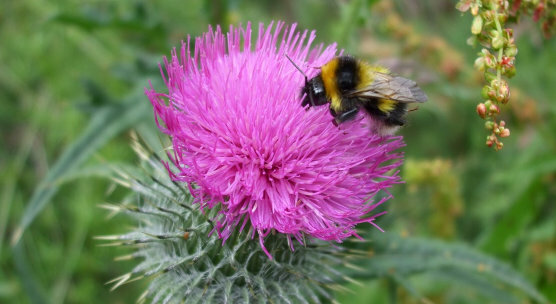 As part of a Europe-wide celebration, the University of Dundee and the James Hutton Institute are taking part in the annual Fascination of Plants Day, to be held at the Botanic Garden Dundee, on Saturday 23rd May, from 10am to 4pm. This is the Garden’s annual open event designed to highlight how amazing plants are on all sorts of levels, not least to the future of mankind. There’ll be a range of activities including wood turning, face painting, scientific workshops, actors, meeting beekeepers and falconry. The scientific workshops and kid-friendly activities offered by Hutton and University scientists will have something for all the family, including plant orienteering, DNA extraction, and Robocrop! The Friends annual plant sale will be held on the same day; the coffee shop, gift centre and plant sales area will also be fully open. Dr Kelly Houston, a plant geneticist at the James Hutton Institute, said: “Plants are crucially important for everyone not least due to their use as food, which is one of the many aspects of plant science we work on at the JHI, and will be part of Fascination of Plants Day. The University of Dundee is internationally recognised for the quality of its teaching and research and has a core mission to transform lives across society. More than 17,000 students are enrolled at Dundee, helping make the city Scotland’s most student-friendly. With high-quality teaching, world-leading research, and a £200 million investment in a compact, friendly campus with an unrivalled position in the heart of the city centre, the University of Dundee has been rated number one in Scotland for the past six years in the Times Higher Education Student Experience Survey. We send more graduates into the professions than any other institution in Scotland and our graduates enjoy some of the highest starting salaries in the UK. See www.dundee.ac.uk for further details.